After a summer of big sales but no big signings, this is a photo that will brighten every Villa fan’s day -Â Leeds fans tell me the boy is a bit special. Still, Martin O’Neill mustn’t stop there. Villa still have a thin squad and need at least two more players before the summer transfer window closes. Fab delph great player i will miss watching his skills at Elland road, gone to the best english club for youths! Martin o neil will def make delph into 1 of the best midfielders england has to offer! Enjoy this lad, its a shame hes left, but he is an absolute talent in midfield. 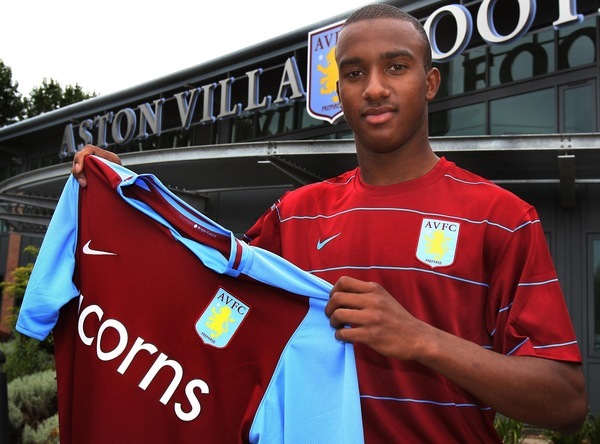 given the right chances at villa he WILL play for england. I hope he serves you well! Quality player, reminiscent of Paul Scholes- box to box, can score goals and definitely likes a tackle- will play for England, no doubt- great signing for you- unfortunately, we need the money as always! He may miss a few games here and there due to suspension but is an all round midfielder. its pains me to see Leeds sell talent like this. I am sure he will serve Villa well but I can’t help feeling deeply miffed about our position. 23,000 tickets sold for first home game against exeter…a great club on its knees for another season! And for lookalikes â€“ I think we have a cross between Theo Walcott and Ashley Young. Great signing-great future-One of the best ever to come out of the LUFC Academy-and that includes Milner, Lennon and all the others. I weep when I see our players on the television or in the papers plying their trade for some other team when we were forced to ‘sell’ for a pittance. Not this boy though-we wish him all the best for the future. Good luck Fab! Rumours are that he’s after snjieder, amazing! !